SOUTH BEND, Indiana (CNN) -- President Obama delved into the abortion debate in a controversial Notre Dame commencement address Sunday, calling for a search for common ground on one of the most divisive issues in American politics. 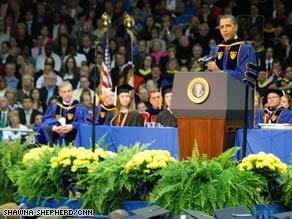 President Obama's appearance at the University of Notre Dame's graduation touched off a storm of controversy. Addressing a sharply divided audience at the storied Catholic university, Obama conceded that no matter how much Americans "may want to fudge it ... at some level the views of the two camps are irreconcilable." "Each side will continue to make its case to the public with passion and conviction," he said. "But surely we can do so without reducing those with differing views to caricature." The president is a supporter of abortion rights and federally-funded embryonic stem-cell research -- positions that are anathema to traditional Catholic teachings. Some graduates attended the ceremony, but expressed their disapproval by donning mortarboards marked with a cross and the outline of an infant's footprints. Others countered by wearing mortarboards adorned with an Obama campaign symbol. All those arrested were charged with trespassing, and two people taken into custody were also charged with resisting arrest, Redmond said. The charges are misdemeanors, and defendants had to post bail of $250 each before being released, he said. Obama asked the crowd if it's possible "for us to join hands in common effort." The president told the audience a story about an e-mail he received during his 2004 Illinois Senate race from a doctor who opposed abortion. The doctor, according to the president, said he voted for Obama during the Democratic primary but felt he might not be able to support him in the general election. iReport.com: What do you think of Obama's speech? "The doctor said that he had assumed I was a reasonable person, but that if I truly believed that every pro-life individual was simply an ideologue who wanted to inflict suffering on women, then I was not very reasonable," Obama said. He said the doctor urged him not to change his views, but rather to speak about the issue of abortion in "fair-minded words." After instructing his campaign staff to change the wording on his Web site, Obama said he prayed "that I might extend the same presumption of good faith to others that the doctor had extended to me." "When we do that -- when we open our hearts and our minds to those who may not think like we do or believe what we do -- that's when we discover at least the possibility of common ground." The president said that while "maybe we won't agree on abortion ... we can still agree that this is a heart-wrenching decision for any woman to make." He urged supporters and opponents of abortion rights to "work together to reduce the number of women seeking abortions by reducing unintended pregnancies, and making adoption more available, and providing care and support for women who do carry their child to term." He also endorsed the drafting of a "sensible conscience clause" to "honor the conscience" of doctors and other medical workers opposed to abortion. Let's "make sure that all of our health care policies are grounded in clear ethics and sound science, as well as respect for the equality of women," he said. "I have no problem with Obama speaking on the campus [but] I do have a problem giving him [this] honor," said Bill Donohue, president of the Catholic League. Catholic Bishop John D'Arcy of South Bend, Indiana, was among those who skipped the ceremony. "President Obama has recently reaffirmed, and has now placed in public policy, his long-stated unwillingness to hold human life as sacred," D'Arcy said in a written statement. Notre Dame President John I. Jenkins noted in a statement in March that the university has hosted Democratic and Republican presidents, and said the invitation does not mean the university agrees with all of Obama's positions. Obama carried the Catholic vote in last year's presidential election by a margin of nine percentage points, 54 to 45 percent. A Quinnipiac University poll released last Thursday suggests most U.S. Catholics wanted Notre Dame to allow Obama to speak, with 60 percent of Catholic voters in the survey saying Notre Dame should stand by its invitation to the president. Observant Catholic voters who attend religious services about once a week said by a 49 to 43 percent margin that Notre Dame should keep Obama on the program. Catholics who attend services less frequently said by a 70 percent to 26 percent margin that Obama should speak, according to the poll. "Neither Americans overall, nor Roman Catholic voters in particular, think Notre Dame should rescind its invitation to President Obama," said Peter Brown, assistant director of the Quinnipiac University Polling Institute. "The strongest opposition to the president's appearance comes from observant Catholics, but more of them than not say he should be allowed to speak." "Catholics are not a monolithic group. If you divide between practicing Catholics and nonpracticing Catholics, you'll find that the practicing Catholics for some reason are opposed to Obama getting an honor. They're not opposed to him speaking at Notre Dame. They're opposed to him being honored," Donohue said. CNN's Sherri Maksin and Ed Hornick contributed to this report.